but it seems more probable that the rite had been introduced before his time, at least in the greater basilicas. It is not mentioned of this Pope that he instituted the ceremony, but in the parish churches. Cardinal Wiseman says that the existence of it in distinct churches, and some of these in the East; for St. Gregory Nazianen, who was a contemporary of St. Zosimus, mentions it, as do other Fathers also. It may then have been in general use then in the early fifth century. Some of the Paschal Candles were very large, weighing thirty, fifty, and even a hundred pounds. A favorite weight in many churches was thirty-three pounds, in honor of the thirty-three years of the life of our divine Lord upon earth, whose pure body the virginal whiteness of the wax aptly typifies. 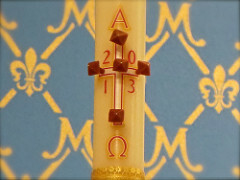 In early times the offices of the entire year, which began with Easter, were inscribed on the Paschal Candle. Later, as their number increased, they were written on a parchment, and attached to it, sometimes by means of one of the grains of incense, to be noticed later on. This custom continued in certain dioceses of France as late as the middle of the last century but with the multiplication of feasts the practice became impossible. The candle was also frequently decorated with flowers or as is still done, with designs in wax or other material; and it had openings for the five grains in incense. 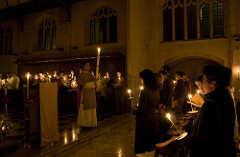 The custom of celebrating Mass on Holy Saturday night is found to have existed as early as the time of Tertullian, that is, at the close of the second century. St. Jerome attributes the keeping of the vigil of Easter to apostolic tradition. There is no little diversity of opinion that exists with regard to the authorship of the Exultet, chanted for the blessing of the Paschal Candle. Father O’Brien in his “History of the Mass” says, “It is almost universally admitted that the composition of this is the work of St. Augustine, but that the chant itself is Ambrosian.” Cardinal Wiseman is more probably correct when he states that “the beautiful prayer in which the consecration or blessing of the Paschal Candle takes place has been attributed to several ancient Fathers: by Martene, with some degree of probability, to the great St. Augustine, who very likely only expressed better what the prayers before his time declared.” And he continues: “It very beautifully joins the twofold object of the institution. For a while it prays that this candle may continue burning through the night to dispel the darkness, it speaks of it as a symbol of the fiery pillar which led the Israelites from Egypt, and Christ, the ever true and never failing light.” The chant is said to be the only specimen of the pure Ambrosian found at present in the liturgy of the Church. The five grains of incense which are blessed to be inserted in the candle, represent by their number and arrangement, the five wounds of our blessed Lord, which were inflicted before His death, but the scars of His healed wounds, of which were retained by Him after His resurrection; and the material of these grains represents the spices with which His sacred body was prepared for the holy sepulcher. Hence, they are put into the candle before it is lighted, and remain there afterward. This Paschal Candle represents, first, our divine Redeemer Himself, dead, and then risen to a new life, to die no more, as the Apostle declares; for the candle is not at first lighted, but only after het performing of a part of the blessing. The grains of incense too are inserted in it before it is lighted, to represent the wounds which caused the death of the Savior of the world. 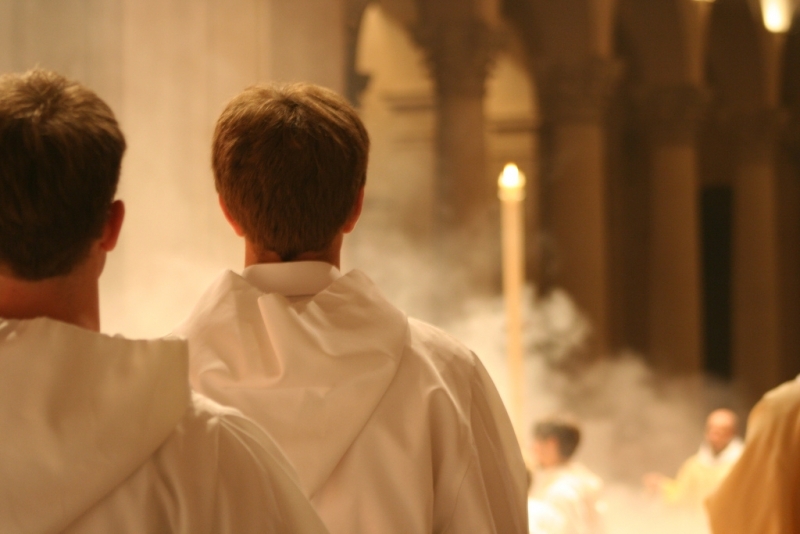 The virginal wax of the candle typifies His sacred body, while the flame and light show Him to be the Word of the Father, enlightening everyone that cometh into the world. Hence, it burns on Sundays from Easter to the Ascension, Sunday being the day on which especially the Word is preached for the enlightenment of the people; but it is extinguished when Our Savior leaves the earth and entrusts the diffusion of His light to the apostles. During the blessing of the baptismal font the Paschal Candle, as representing Our Savior, is thrice lowered into it, the celebrant praying meanwhile that the virtue of the Holy Ghost may descend into the sacred font and sanctify it, as He descended upon Our Lord when He was baptized in the Jordan, thereby imparting to water the power of cleansing from sin those to whom it is applied according to the institution of Christ. There is a relation between the Paschal Candle and the Agnus Dei which is deserving of notice. It is seldom that the Paschal Candle is entirely consumed before the feast of the Ascension. 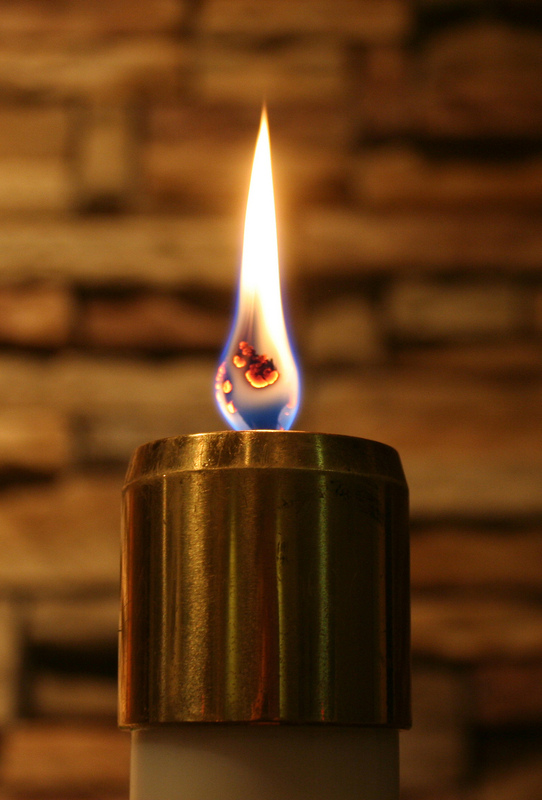 It was not the custom in early times to remold the remnant of the candle left when it was finally extinguished, but the faithful were accustomed to procure small portions of it and keep them in their homes as a sacred amulet to protect them against evils, especially against tempests. All authors agree that it was from this pious custom that the Agnus Dei, which is now almost universally worn by devout Christians, derives its origin.